Osteosarcoma awareness wristbands can be used as part of events to promote the event, raise funds, or simply show support. Fewer than 20,000 people per year are diagnosed with Osteosarcoma. Though this number makes Osteosarcoma considered rare, it is the leading form of bone cancer and needs an increase in awareness to ensure it is diagnosed and treated. Osteosarcoma Awareness Month is in July, with many events being held across the country to raise awareness, support, and funds for the disease. Osteosarcoma color is yellow which is used for all forms of bone cancer. At AmazingWristbands.com, you can create custom wristbands for free! All wristbands from AmazingWristbands.com are made of comfortable, latex-free, and non-allergenic silicone. 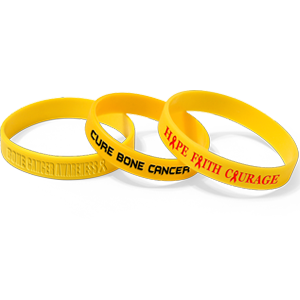 You can add your own message and artwork to your Osteosarcoma cancer awareness bracelets to make them specific for your cause of event. Osteosarcoma is a type of cancer that forms in the bone and inhibits the growth of strong bones. It most commonly occurs at the end of the long bones near the knees, in either the distal femur or proximal tibia, and shoulder joint, in the proximal humerus. However, it can affect other bones throughout the body also. Osteosarcoma is most commonly found in teenagers but can occur at any age. Pain or swelling in the joints or affected bone, a sudden break of a bone with little trauma applied to the bone are potential signs of Osteosarcoma. Doctors can confirm diagnosis through use of MRIs, CAT scans, biopsies, X-Rays or chemical studies of blood. Treatment options for Osteosarcoma can include surgery, radiation, chemo therapy and even amputation. Help spread awareness for this disease. You can create your own custom Osteosarcoma wristband using the online builder at AmazingWristbands.com. Here’s what you can expect from us. 100% silicone that are non-allergenic and latex free. In addition to standard wristbands, AmazingWristbands.com also offers super popular slap bands that “snap” to a person’s wrist. We also offer thin half-inch bands, thicker one-inch bands, adjustable bands, USB bands, silicone rings and silicone key chains. All our silicone products are made of 100% silicone so they are comfortable, durable, and non-allergenic. 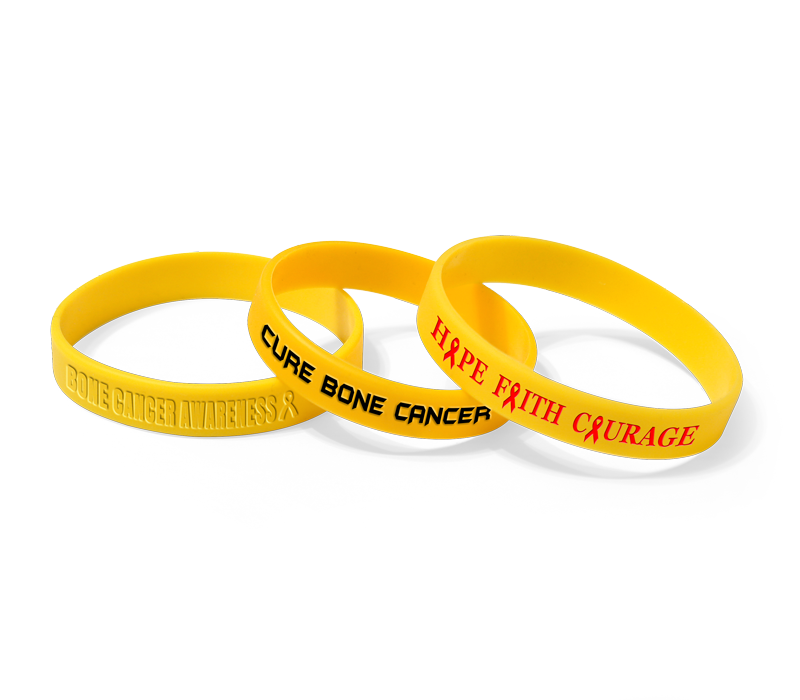 Get a detailed quote for your Osteosarcoma wristbands in minutes!